SCE Troubleman Eric Meyer performs some work at an underground vault. SCE Troubleman Eric Meyer takes a call from dispatch. SCE Troubleman Eric Meyer prepares to troubleshoot a customer call in Irvine. SCE Troubleman Eric Meyer checks out a customer's electrical panel. SCE Troublemen Eric Meyer (left) and Mark Martinez do a tailboard to discuss what work needs to be done at an underground vault. SCE Troubleman Eric Meyer calls the Grid Control Center to provide an update on work at the underground vault. SCE Troubleman Eric Meyer explains the problems with a transfer switch to T-Mobile technician Anh Nguyen. T-Mobile technician Anh Nguyen shows his gratitude to SCE Troubleman Eric Meyer for helping to explain a problem with one of their transfer switches. Eric Meyer takes us on a ride-along to see how he helps safely restore power to residents and businesses in the Saddleback District. As he pulls his truck No. 30340 into the complex on a quiet residential street in Irvine, he locates the resident’s house No. 66. Before Meyer has a chance to knock on the door, he’s greeted by customer Gayle McCue. “I feel better now that you are here,” said the elderly customer, who noticed her power was off when she woke up that morning. She had gone to her neighbor’s house to ask for help since she doesn’t have a cell phone. ​It doesn’t take Meyer long to figure out the problem. Someone has turned off the circuit breakers in McCue’s electrical panel. He puts on his safety gear before quickly resetting the breaker and getting McCue’s power back on. He also advises her to put a lock on her panel to prevent any future tampering. McCue appreciates the troubleman’s help on this day. “Tell him he did a good job,” she said. A native of Missouri, Meyer served in the Navy for three years before a friend encouraged him to pursue a lineman job. 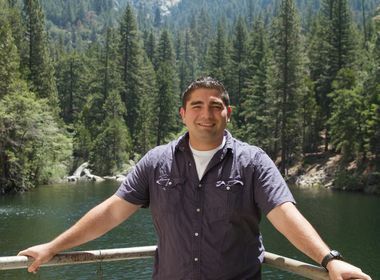 He worked for Hawaiian Electric for a few years before heading to California in 2005 with his family. 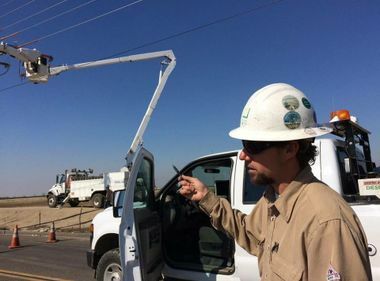 He’s been with SCE ever since, first as a lineman and now as a troubleman. As he approaches Campus Drive in Irvine, fellow troubleman Mark Martinez has started preparations at the underground vault. A crew had earlier finished some work and Martinez and Meyer are there to do a final check. Both men prepare their safety gear before their tailboard, which includes emergency response procedure details, to discuss what work needs to be done. Donning their required safety gear — gloves, helmut, glasses, flame-resistant overalls — the troublemen take turns entering the de-energized 12,000-volt vault to do a visual check on the brand-new installation, including a check of the tags. Unlike many of the cities in SCE’s 50,000-square-mile service territory, much of the electrical lines in the city of Irvine are located underground. Troublemen in the Saddleback Service Center, an area that includes Irvine on the north and parts of Mission Viejo and Laguna Beach to the south, must go through special training to troubleshoot these underground lines. With the switch now ready for operation and remotely controlled, Martinez has a few calls waiting for his troubleshooting. They include: an outage due to a metallic balloon, a broken underground structure and downed equipment. As Martinez heads off in his truck No. 37111, Meyer picks up the remaining safety cones to head to another job on McGraw Avenue. A technician with T-Mobile has called to report that one of their transfer switches for a backup generator is out, possibly due to a power outage. As Meyer pulls up to the business, T-Mobile technician Anh Nguyen explains the problem. Their office building has power, but the one transfer switch is not working. Nguyen walks Meyer around to the side of the building which houses the large switches. Meyer’s gut tells him almost immediately that this is not an SCE problem, but a defective switch. After a few minutes of testing the lines, everything tests OK on the utility’s side. At first Nguyen is not sure of Meyer’s explanation, so the troubleman walks him through what he’s found, drawing out the scenario for the customer. For troublemen like Meyer, they are often the first responders on the scene when a customer’s lights go out. 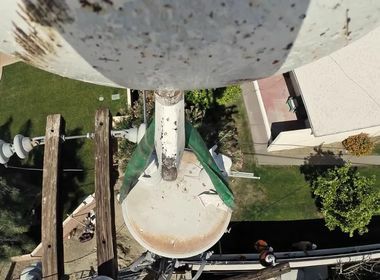 Working alone, they are sent to the site to troubleshoot the situation and either fix the problem or call for additional help to get the job done. It’s a job that’s not for everybody, explains Meyer. The hours are long, including 24-hour shifts. During a storm situation, they are often on for a 16-hour shift, followed by an eight-hour break, then back on for a 16. It’s not rare to miss a Christmas or Thanksgiving holiday with the family when you are a troubleman. During one Thanksgiving, Meyer helped a family get their power back on and they were so grateful they insisted he take home an apple pie to thank him. It’s all a part of the job, said Meyer. Meyer encourages those interested in this line of work to start off as a groundman. A three-year apprenticeship follows before a person is qualified to become a lineman. You’ll also have to put in a number of years as a lineman to qualify to become a troubleman. As Meyer gets back to his truck, there are a few more calls ready for him to troubleshoot. It will be like this, he said, until his shift is over in a couple of hours.